I am love checking out cookbooks from the library because I really enjoy reading cookbooks and getting inspiration from them. I recently brought home Ina Garten’s Barefoot Contessa Foolproof and I loved it! I have so many recipes bookmarked to make. I started with this spinach recipe that looked super simple and really flavorful… I was right. 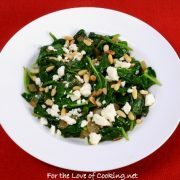 I liked the combination of the onions and spinach with the lemon, pine nuts, and the salty feta. My husband and I LOVED this spinach while my daughter thought it was pretty good. My son, on the other hand, wasn’t very impressed and grumbled a bit while eating it. Can’t win them all. A great way to use our garden spinach, loving that lemony taste! First of all, I really admire Ina Garten and her food sense so I’m not surprised that you liked her cook book. Second, this salad does look like the perfect combination of tanginess and saltiness, that works to temper the astringency of the spinach … healthy too! Third, feta seems one of those cheeses that one either loves or hates … in our house, I’m a lover and SB is the hater! Like you said … can’t win ’em all! I love that cookbook too, so many great recipes. Your spinach looks wonderful, I think I’d be quite happy if someone in my family didn’t like it, then I could have their portion too! 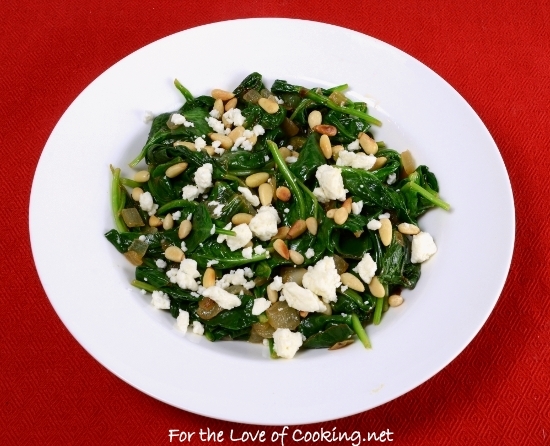 This sounds like a delicious take on spinach, especially with the feta. Good afternnon. Its the firt time i came here to visit your Kitchen. Tts very nice your blog and the sugestions looks delicious and healthy ! Grumblers. We wouldn’t appreciate the rest of the hungry horde as much without the grumblers, would we? This looks like a nice treatment for spinach. I used to take out cookbooks from the library all the time when I lived with my parents…and for some reason I stopped when I moved to Manhattan. WHY. Love the flavors in this spinach!! I think lemon and spinach were made for each other. I love checking cookbooks out of the library too. 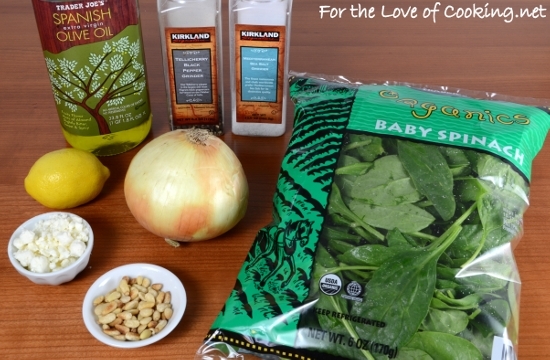 This looks like a great spinach dish, great flavor combinations. I am the same way with a new cookbook, the first thing I do is browse through it and assault it with book tabs, lol. i tried this salad as a side to some homemade shrimp scampi. i used goat cheese as my grocer only sold flavored feta. 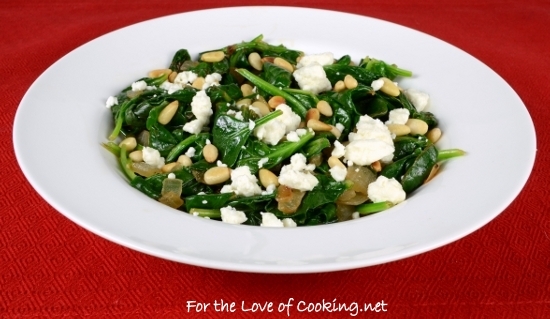 the wilted greens with the mellow pine nuts and lemon zest is delicious….the goat chesse softend on the warm leaves and added additional flavors. a nice mix of flavors. reccomended.